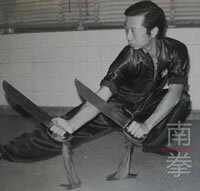 The set Geui Chung Dou (Butterfly Knives of Geui Chung) is named after my ancestor, Lam Saam Gung, who created the set. The set is also called the Hang Yut Dou (Crescent Moon Knives), because of its techniques. 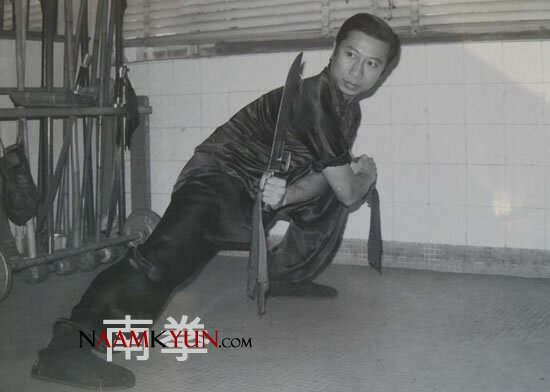 Lam Saam Gung learned Siulam kung fu and he was very good at knife techniques. After he had learned for about ten years, he created this knife method. The set Geui Chung Dou contains many techniques, which are all very practical and ruthless. The upward directional techniques include: big crescent moon, surrounding heels with blossom, carp jumping over water, releasing lotus flower, butterflies flying around the flowers, and Cheun King1 presenting the mace. Many people agree that the upward directional techniques are very powerful, especially the scissors for upper and lower sections. These techniques are fast and clear and very useful for fighting against a stick. Other techniques in this set are: cat is washing its face, tiger is going into the woods, tiger tail is pulling a ball, lazy man is digging the field, big cutting like a windmill, four heads and two roofs, lion is opening its mouth, blocking scissors, double low knives, rooster is standing on one leg, lazy rooster is showing its wings and a beauty is combing her hair. These techniques are very fast in action and the opponents cannot predict what you will do next. Lam Saam Gung considered the Geui Chung Dou to be very precious. Therefore, he taught this method only to his sons. Even his daughters were not allowed to learn this set. Lam Saam Gung taught my uncle, Lam Sai Wing, all the techniques of the Geui Chung Dou. The i was the secret knife method of the Lam family. Therefore, those who were not from Lam family did not have the chance to learn it. However, my uncle, Lam Sai Wing, was a generous person and liked teaching all of the techniques to his students. It is appreciated that he passed on all the techniques he knew. 1 Cheung King (Qin Qiong in Mandarin) is the Chinese ‘door god’.